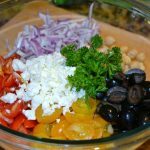 Orzo Tomato Salad has sweet cherry red and yellow tomatoes, chick peas, black olives, red onions, feta cheese and orzo pasta that is drizzled with a lemon blood orange olive oil dressing. Make dressing-mix all ingredients together and set aside. Make salad: Place all ingredients a large mixing bowl, except the Orzo pasta. Place the Orzo and chopped parsley over the top of all ingredients, drizzle the dressing over the top. Cover with plastic wrap and refrigerate 2 hours for flavors to blend. This can be a main dish salad or serve with grilled meats as a side. *Can substitute blood orange olive oil with regular olive oil.